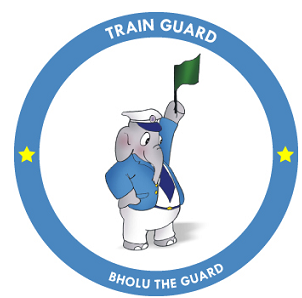 The Ministry of Railways declared in 2003 that Bholu, the Guard holding a hand signal lamp, chosen as the official mascot for the celebrations of the 150th year of the Railways in India. And later, the Ministry announced that the Bholu would be retained as a permanent mascot for the Indian Railways. Bholu is known to be an ethical, responsible, sincere and cheerful icon. He is also the most universally accepted symbol of train running and interaction with passengers. He not only denotes stability but also represents the workforce of the Railways. The Guard is with the train passengers at all times, day and night, and, as train in-charge, is responsible for the safety of a running train and the well-being of passengers. The green light in his hand symbolizes movement, the intention to go ahead with safety and positivism. The Indian government released a two rupee coin which carried the impression of Bholu on its reverse side. This Website does not claim any originality and cannot be used as a substitute for prescribed Rule books, Acts, Codes and manuals .The information presented here is nearly a collection for the use of Train Guards. We would like to acknowledge various sources like freely available materials from Internet and Government publications. The Ownership of the information rests with the respective institutions. Further this Website (http://www.trainguard.in) is not intended to be used for Commercial Purpose. All efforts have been made to make this site useful to Train guards in their daily work and in dealing with many abnormal situations that they generally face. It has, however, to be clearly understood that this site does not supersede or alter or substitute in any way the rules contained in the G&SR, other Acts, Codes, etc. For specific rules on different subjects, the guards should refer to the General Rule’s book and other Manuals.This Website is not officially affiliated with Indian Railway! The Official Website of Indian Railways is http://www.indianrailways.gov.in.